After screenings all over the world, Sola Coffee announces the premiere of director Brandon Loper’s documentary “A Film About Coffee“. 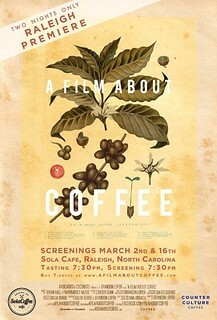 “A Film About Coffee” seeks to answer how the titular beverage has become a mainstay of culture all over the world. The film follows the production of coffee from farms in Honduras and harvests in Rwanda to its global consumption. Listening to farmers, buyers, roasters and baristas about the crop’s economic and environmental implications both locally and abroad, the narrative travels to coffee shops in Tokyo, Portland, Seattle, San Francisco and New York, with stops in between. Dropping in on artisanal cafes to investigate how each prepares its own unique cup, the film opens a window into the little-understood world of specialty coffee. The screening will be held March 2nd at Sola Coffee Cafe. Join the staff at 7pm for a coffee tasting with Counter Culture’s Lem Butler. The documentary begins at 7:30pm. Tickets may be purchased at Sola and are $10 (includes a complimentary coffee, beer or wine). Dinner may also be purchased. Space is limited. To guarantee a seat it is recommended that tickets be purchased ahead of time.